"Move - Be Still - Nourish - Sleep - Awake"
Move - Everyone needs to be active during their waking hours. I am not saying you need to work out 3 hours a day. In fact, I would not recommend that kind of intense workout unless your profession depends on it. What I want you to avoid is going and sitting in a chair 9 hours a day at work, sitting in a vehicle commuting 1-2 hours a day and then going home and sitting on the couch another 4 hours watching television. We all need to get outside and just walk around more. We need to spend more time with our family and friends playing outside. I am always inspired when I see families in my neighborhood out for a walk together after dinner. Everyone should try to get out to a forest and "bathe" in nature as often as possible. Be Still - Everyone needs some quiet time to themselves to let their brains decompress. Some may do this through mindfulness meditation. Others may just go sit outside and watch the wind blow the leaves of a tree. Just 10 minutes a couple of times a day can be very useful. Nourish - A large part of what I do is teach people how to nourish their bodies by eating real, nutrient dense, food. This is certainly an important aspect of nourishing yourself but definitely not the only aspect. You also need to nourish your spirit and your mind. Humans are naturally curious social creatures. We thrive when we are learning new things and contributing to our community. Find something you have always wanted to try and try it. Better yet, find a group of people who are interested in the same thing and contribute your resources to that community while you are learning about something new. Sleep - I cannot under-emphasize the importance of this aspect of your life. Sleep helps your body rebuild and lets your mind sort out your thoughts. I know many people who chronically deprive themselves of sleep. They justify this by saying that they do not have time to get a proper nights sleep but I also know these same people will spend around 2 hours a night watching television or checking on their social media feeds. If you feel that entertainment is more important than sleep, you will find that you will still struggle with achieving your health goals even if you do everything else perfectly. Ideally, you should fall asleep effortlessly at the end of the day and wake up on your own the next morning. 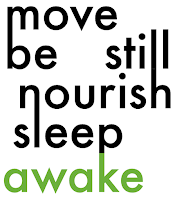 I challenge you to try to get your sleep optimized before you contact me. I will bet that you will see a big improvement in your health without needing any guidance from me. If you sleep is on target and you have continuing health issues, that is the time to reach out to me. Awake - There is the obvious meaning of this, we all want to wake up every morning. I mean that of course, but I also mean awake on a deeper level. Awake means that you should really take a look at your life. Are you happy? If not, what is causing your dissatisfaction? Awake is not a destination, it is a journey. Awake is the perfection you should constantly be seeking for your own well being and personal development. This may sound selfish but your personal satisfaction with your life will affect everyone in your family and community. Everyone loves being around happy and optimistic people. If you are doing the 4 other steps above then being developing your own happiness will be the result of taking care of yourself and those around you. Life can be fantastic if you want it to and you put the work in to make it that way. I hope you have a fantastic day!